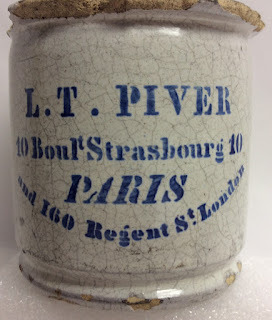 This page is dedicated to tin glazed / Delftware pots produced from retailers in the U.K. and France. 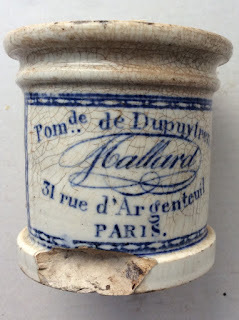 rather than the pottery made in the Dutch town of Delft. 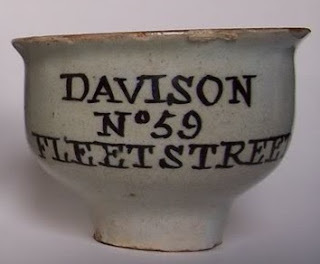 The pottery was produced on a commercial scale in London in the 16th century and remained popular until the 18th century at which time it declined due to competition from regional potteries such as those based in Staffordshire. 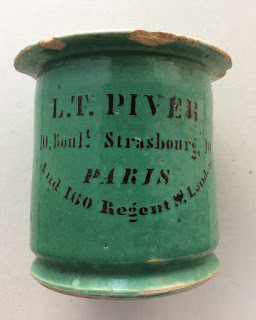 The major production centres in Britain were in London close to the river Thames at Lambeth, Southwark and at Vauxhall. 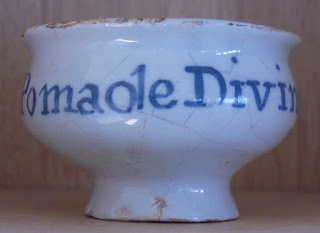 Regional centres then followed located in Liverpool and in Bristol. 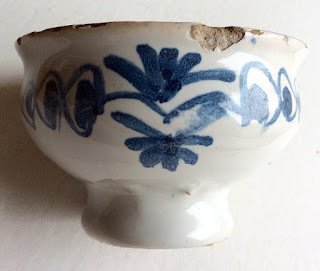 Delftware is a type of tin-glazed earthenware. 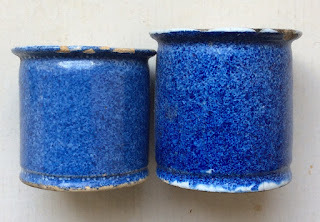 Pots were fired at a low temperature then dipped in a tin oxide glaze to make them white and opaque. 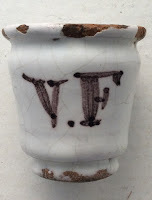 The design was then hand-painted onto the surface and it was re-fired. 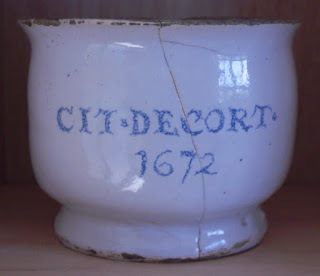 Delftware arrived in England around 1567 when Dutch potters fled Antwerp following religious persecution. 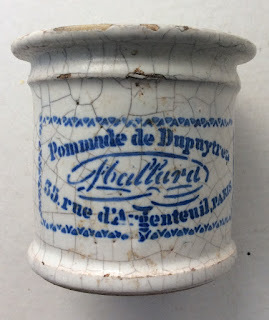 The majority of Delftware ointment pots were plain glazed pots of various shapes and sizes without any markings. 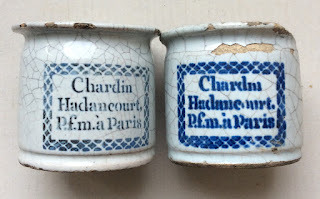 Some pots however do bear patterns and designs but these are quite rare. 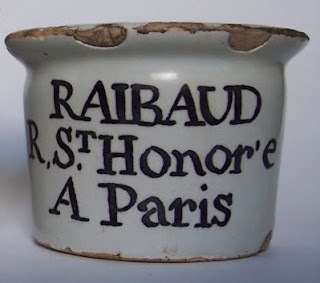 Rarer still are pots with the manufacturers name on, hand painted inscriptions and often of crude making with various styles of script. 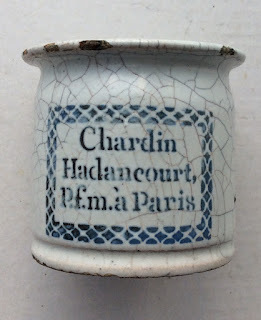 and on the bottom edges. 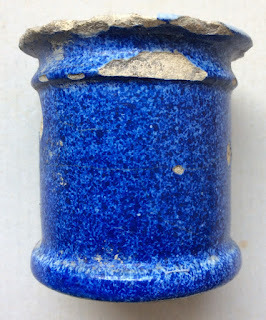 Body glaze chipping is also quite common. 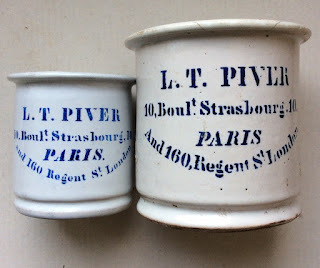 The majority of the pots were produced for retailers in the UK but also many can be found for retailers in France. 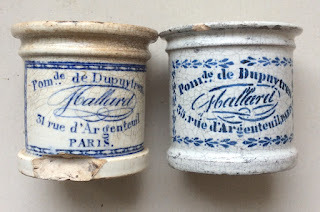 I imagine very few collectors of these pots have been able to amass a collection due to their rarity with the majority of the delftware pots probably held in private institutional collections (museums). 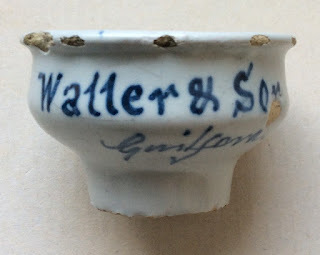 I have also been granted permission able to include on this page some pictures of fabulous Delftware pots from private collections for you to see and enjoy. 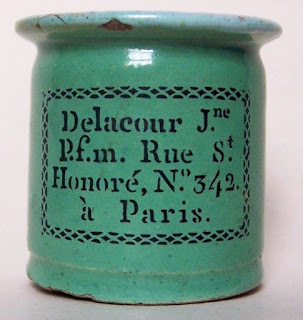 Historical Guide to Deltware and Victorian Ointment Pots book. 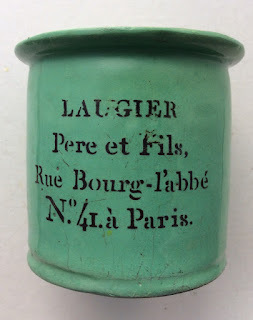 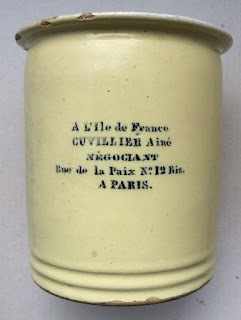 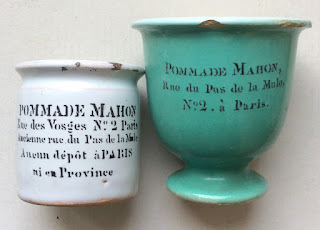 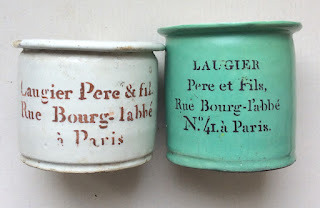 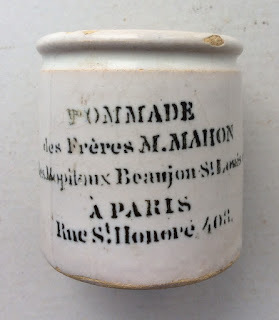 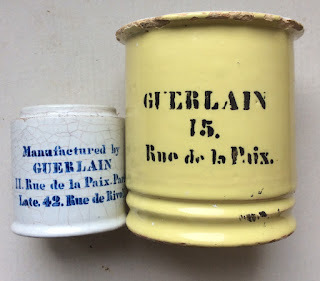 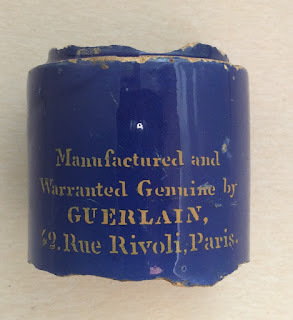 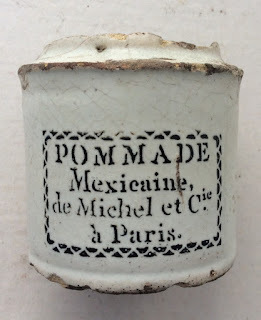 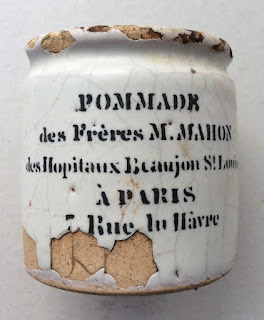 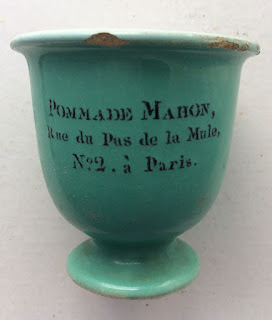 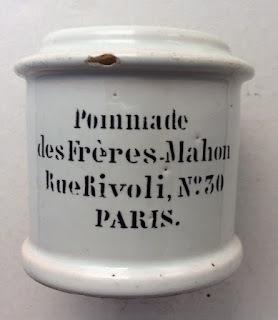 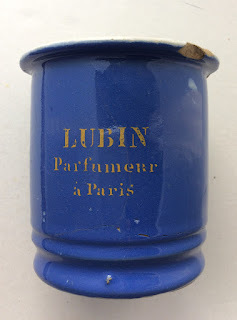 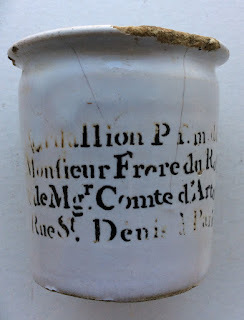 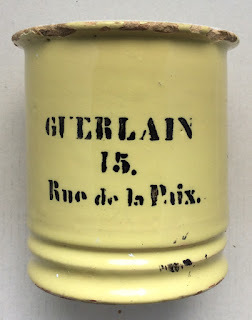 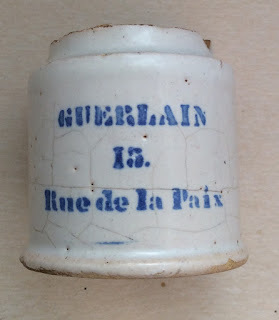 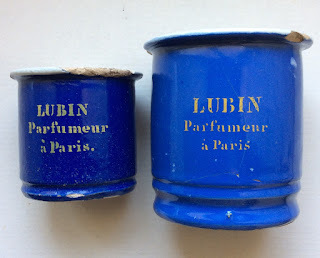 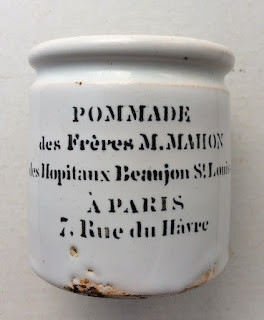 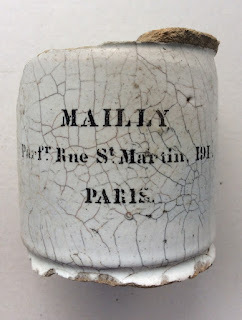 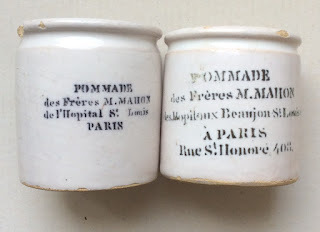 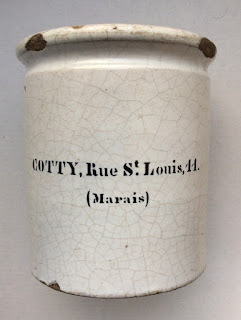 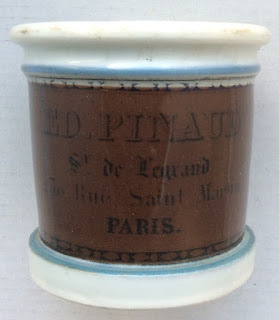 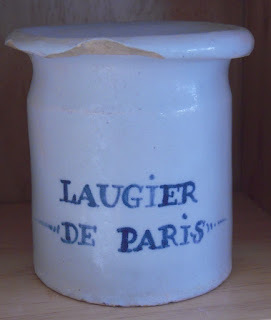 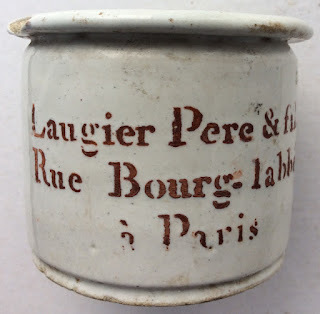 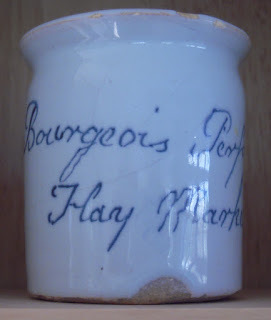 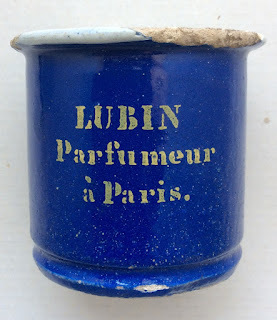 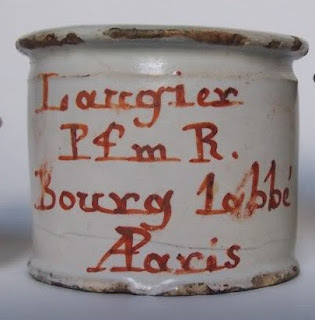 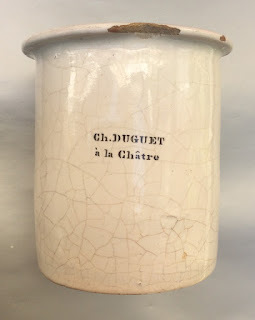 I am fortunate enough to own some of these French pots in my collection. 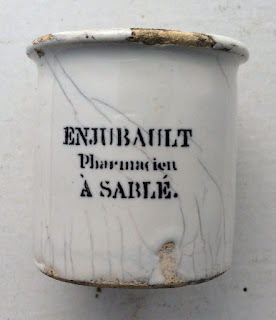 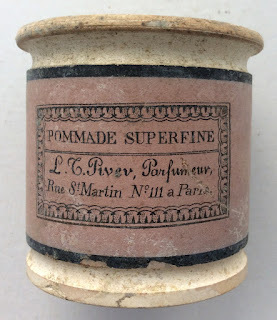 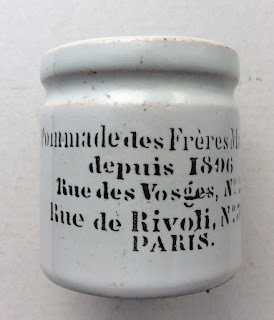 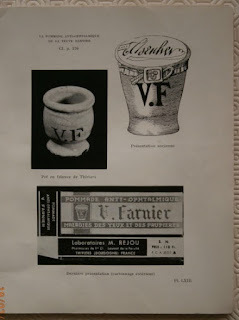 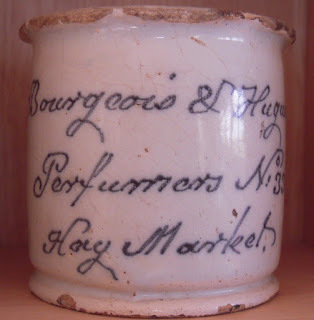 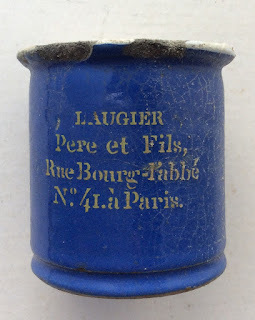 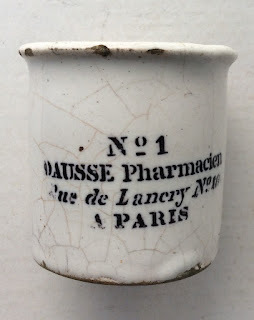 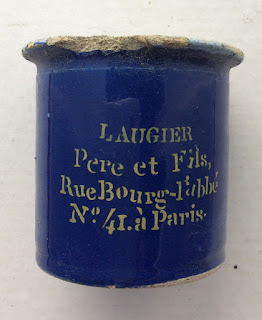 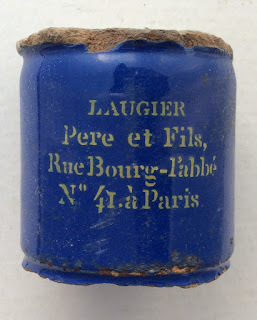 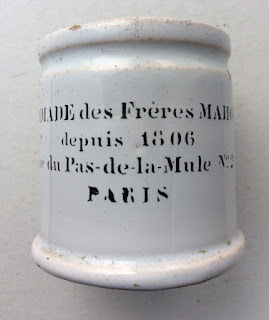 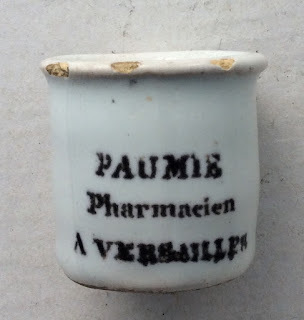 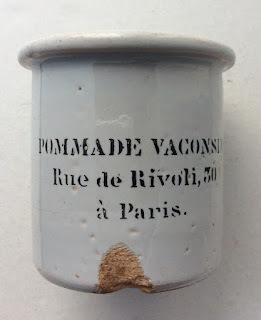 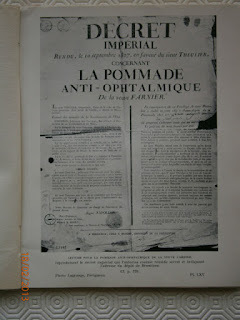 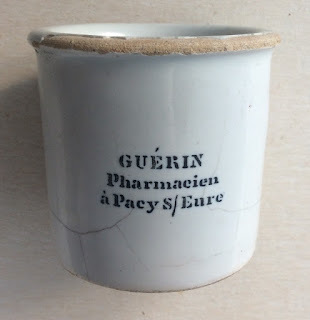 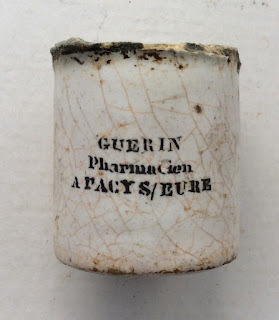 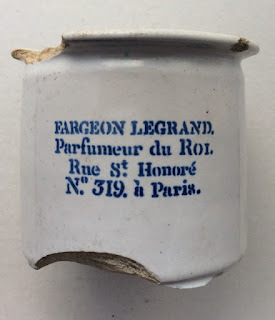 There is a separate gallery for the VF - Veuve Farnier pots (eye ointment / salve) at the bottom of this page. 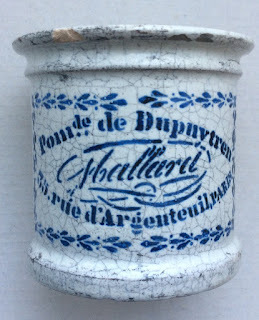 The following gallery shows tin glazed Delftware pots produced for retailers in France. 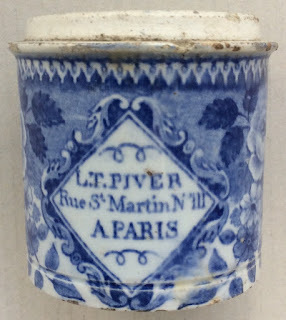 underside, plain blue glazed body. 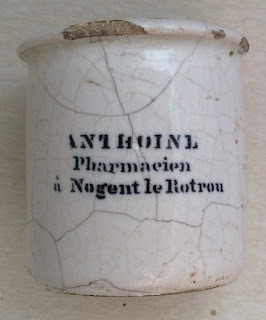 with no transfer around the body. 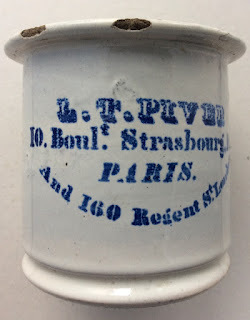 However the pot has a transfer on the underside, plain blue glazed body. 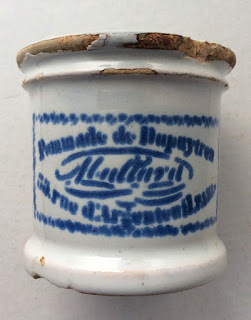 Craint l'humidite - keep dry ! 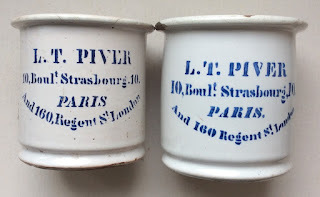 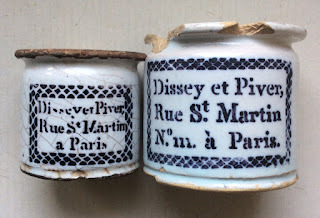 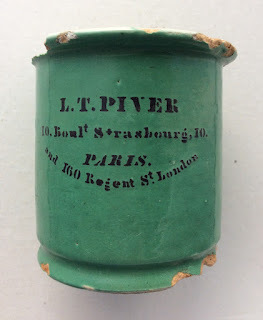 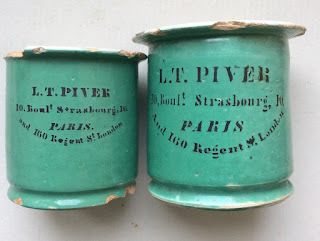 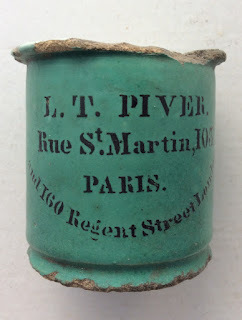 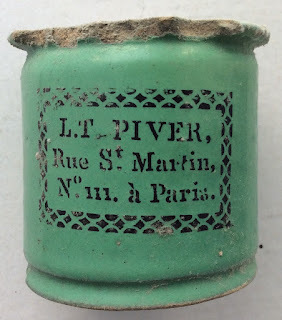 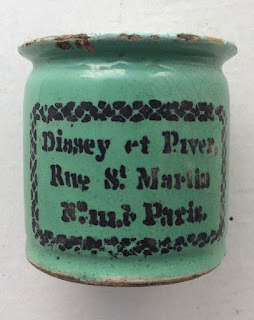 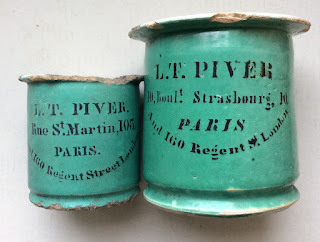 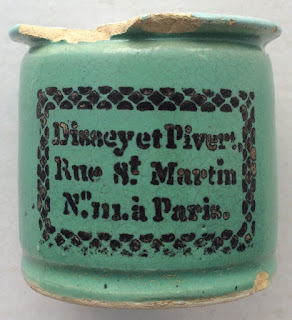 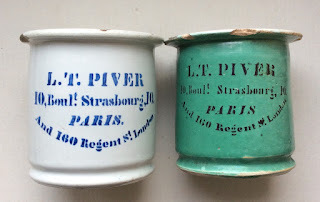 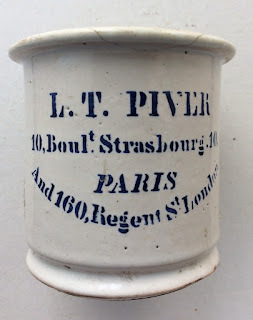 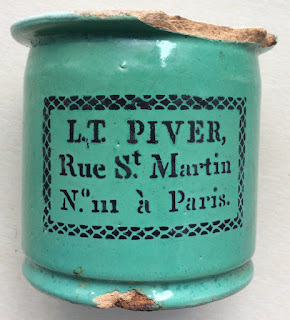 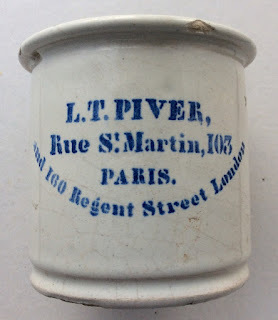 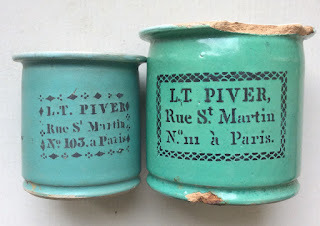 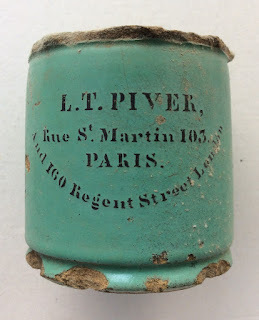 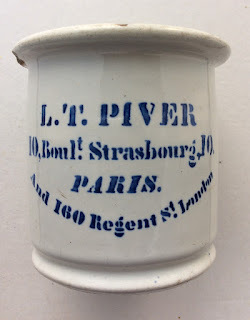 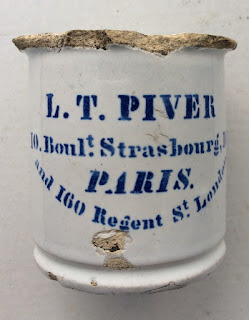 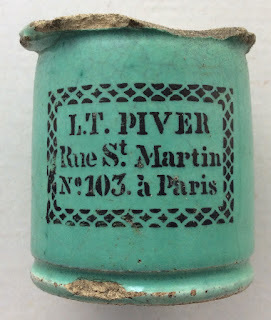 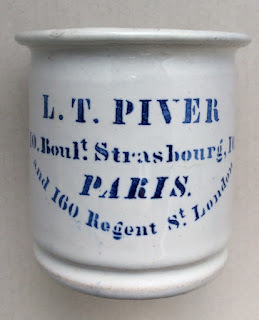 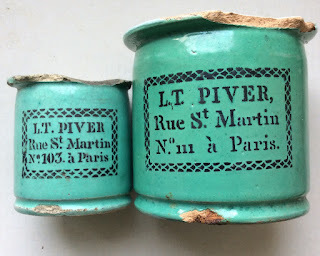 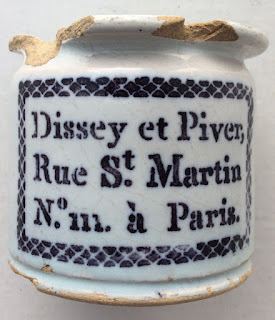 The earlier pots carried the name Dissey et Piver. 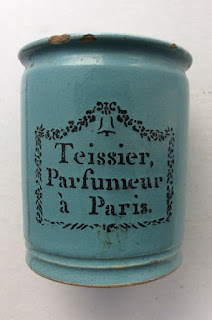 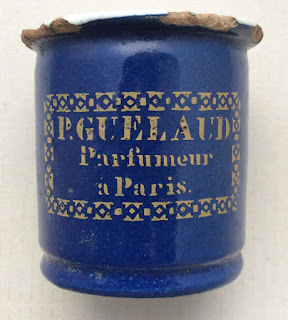 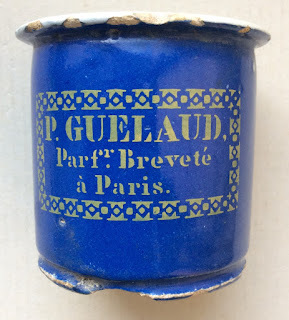 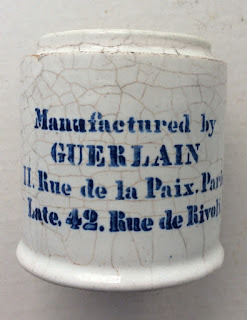 In 1828 Pierre Francois Pascal Guerlain opened a boutique at 42 Rue de Rivoli. 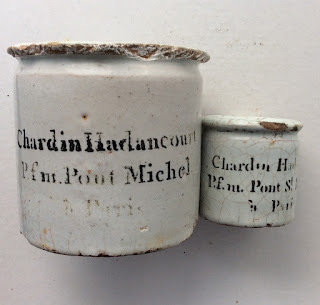 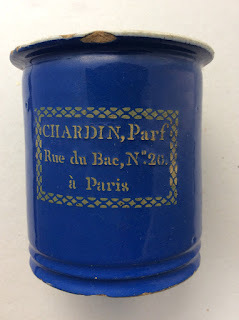 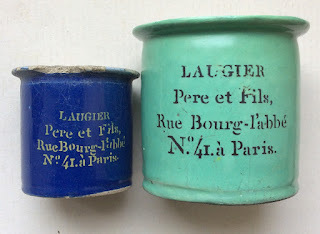 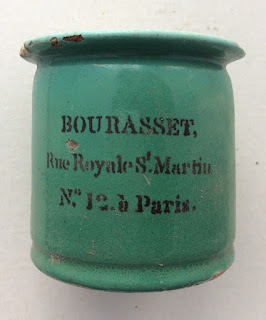 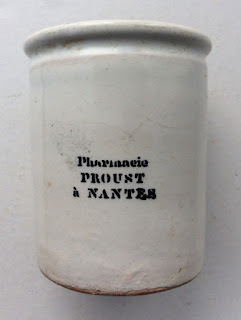 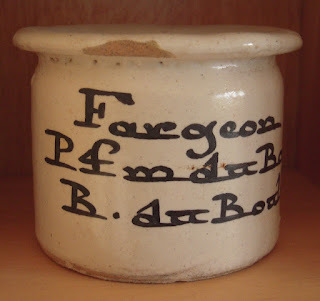 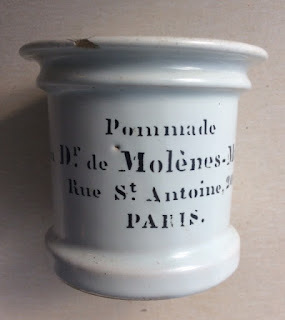 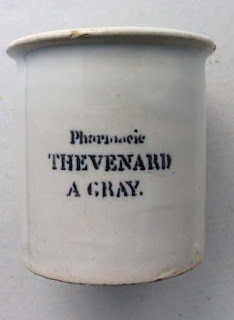 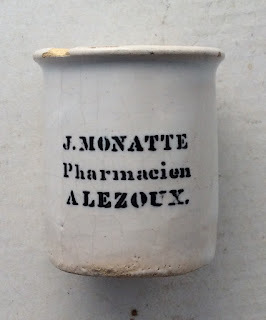 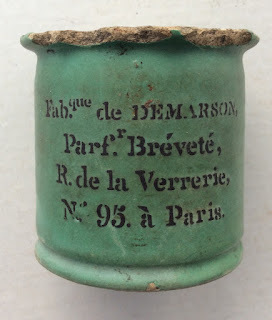 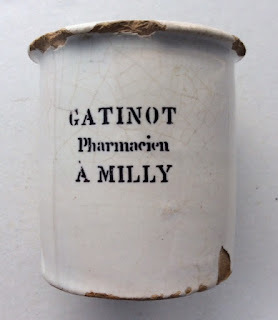 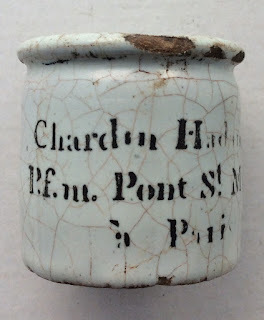 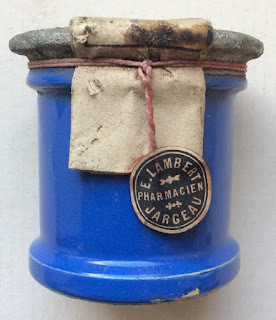 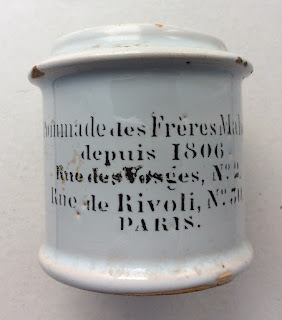 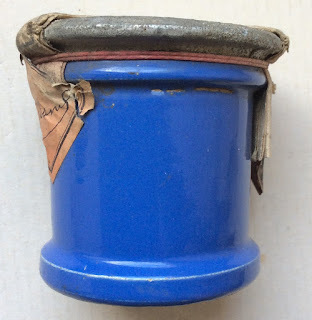 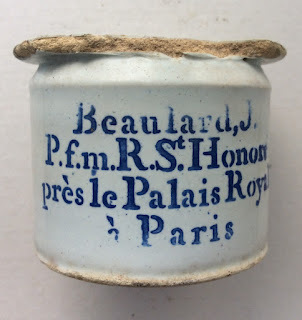 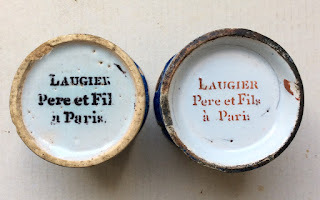 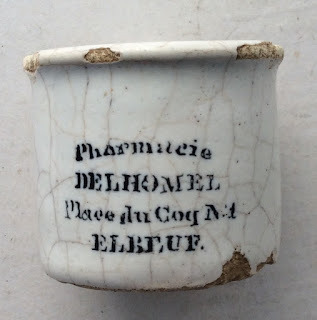 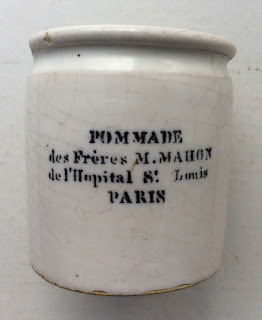 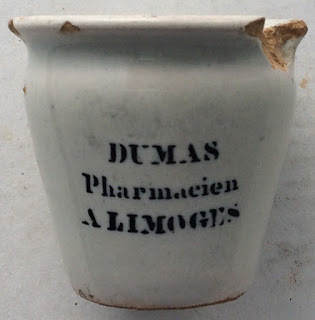 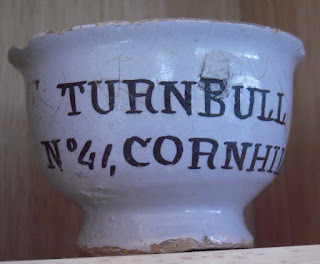 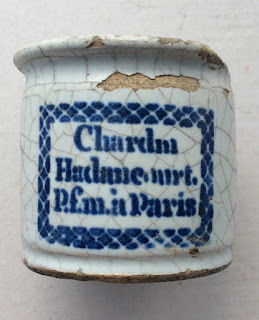 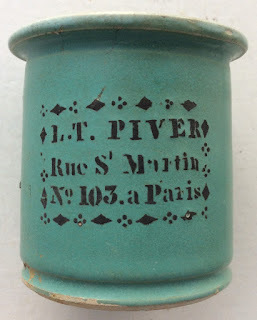 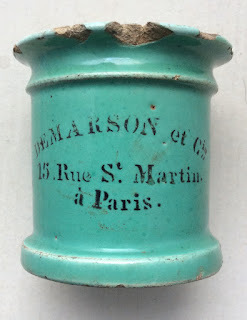 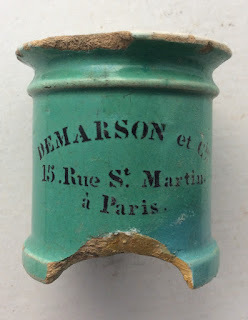 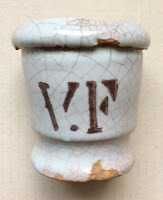 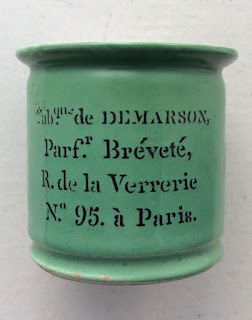 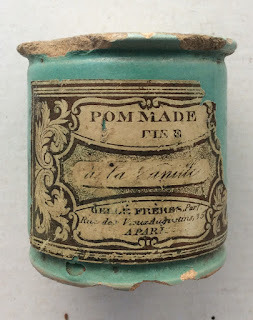 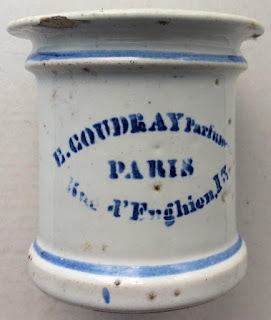 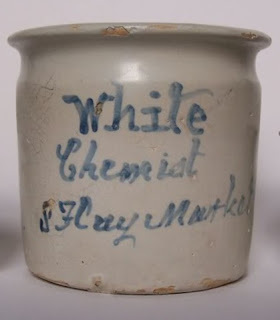 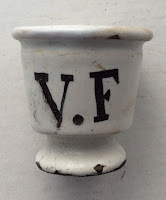 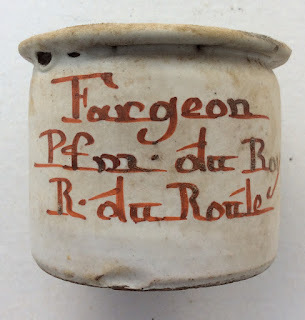 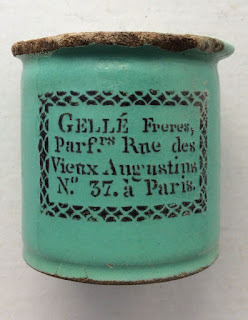 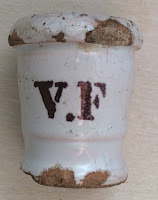 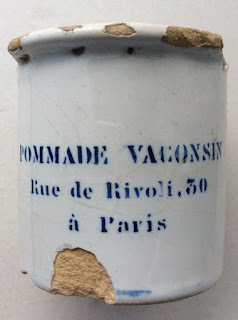 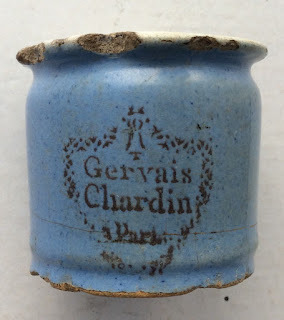 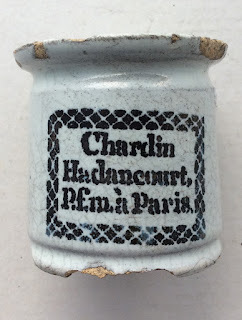 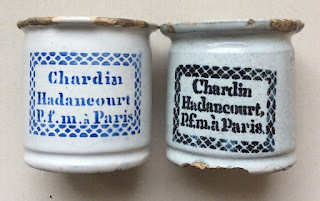 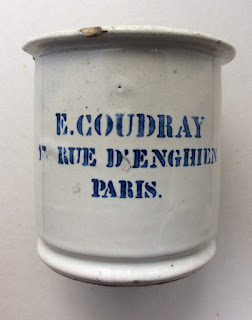 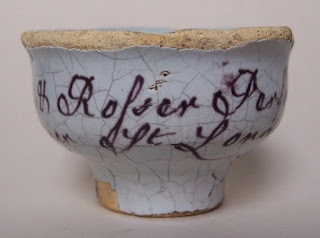 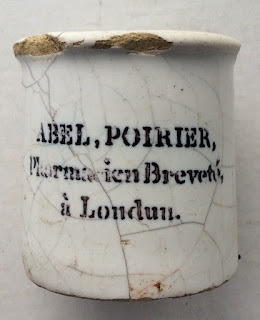 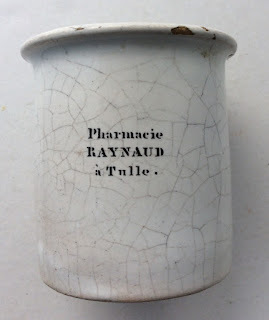 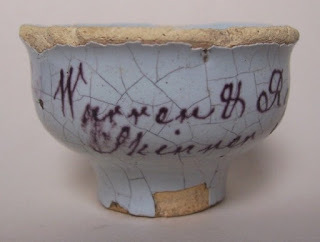 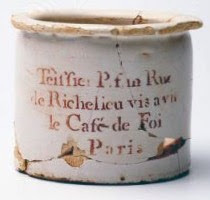 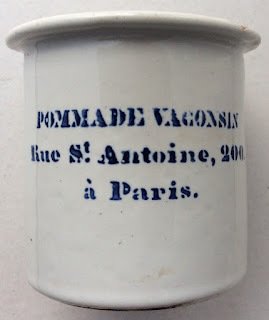 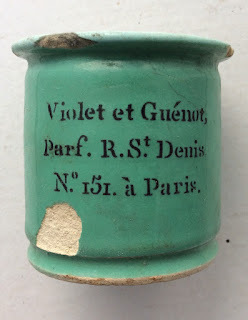 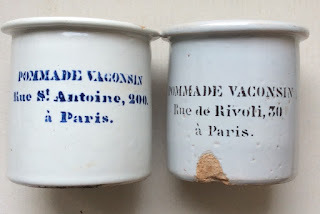 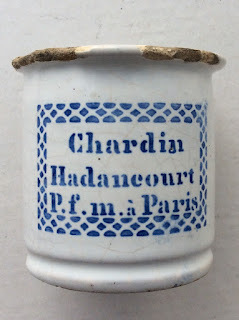 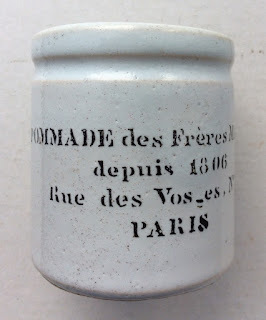 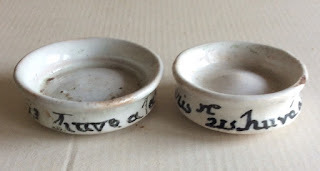 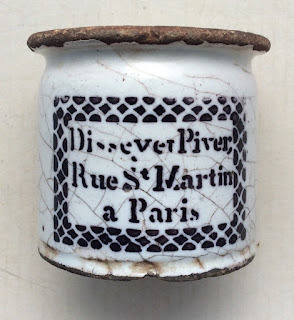 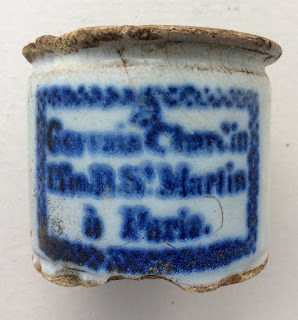 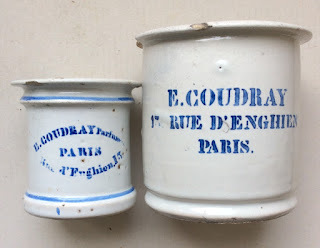 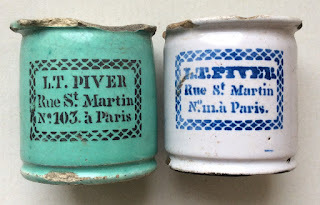 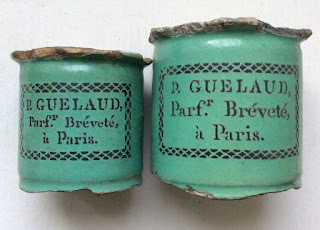 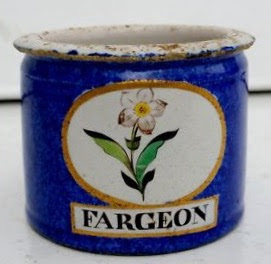 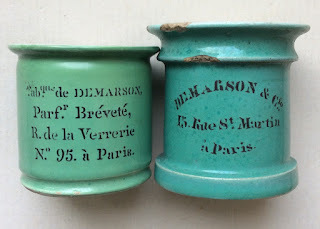 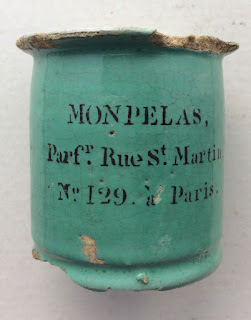 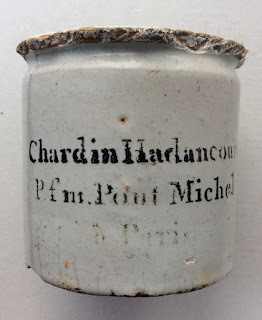 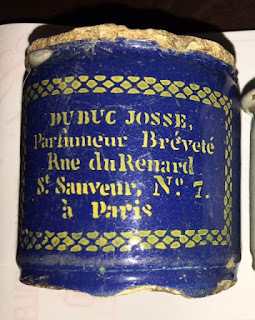 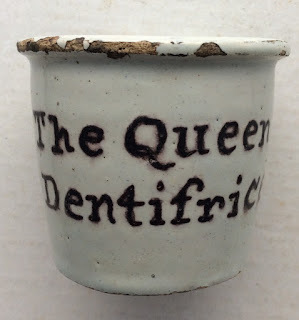 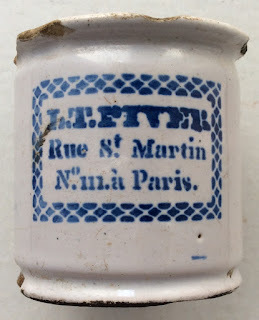 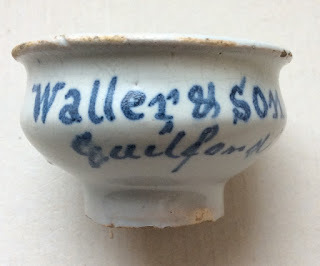 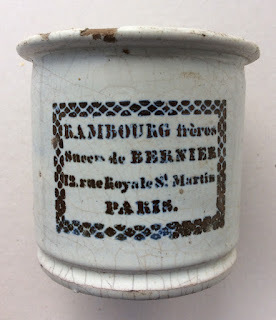 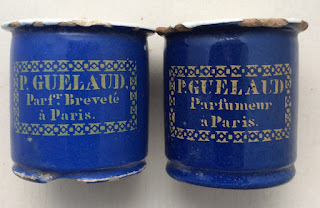 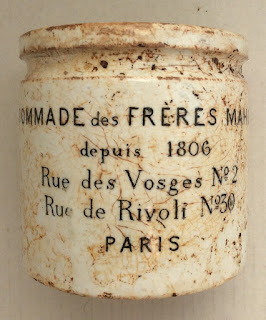 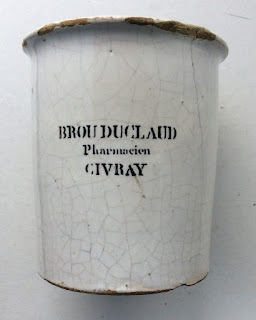 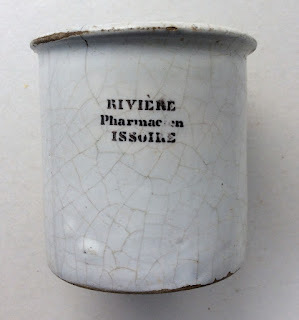 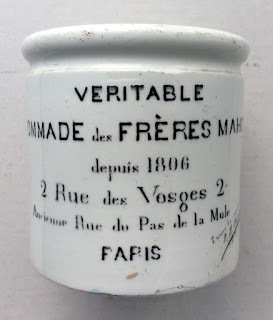 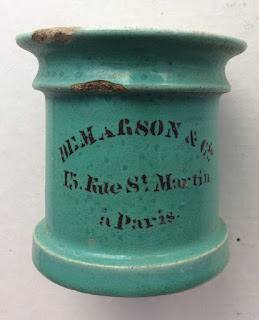 Pots with the initials VF are French tin glazed (technically called 'Faience') ophthalmic eye ointment pots. 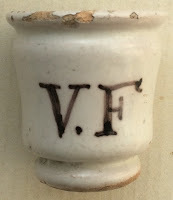 The 'VF' are the initials for Veuve Farnier, the widow Farnier, who had a family chemist shop in the town of Theviers, France. 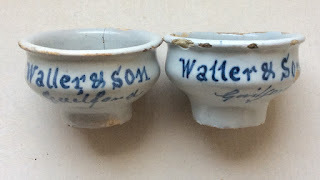 They can date from around 1800 to about 1850. 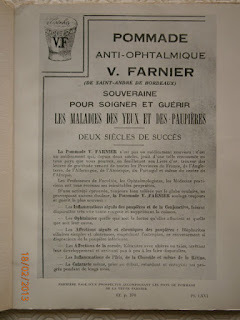 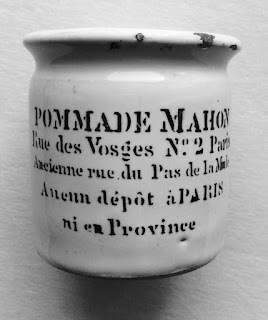 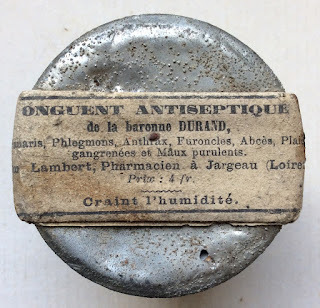 The eye ointment of the widow Farnier, was created in 1764. 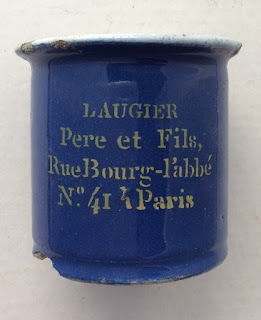 The maiden name of the widow was Theulier. 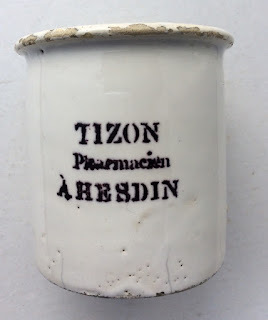 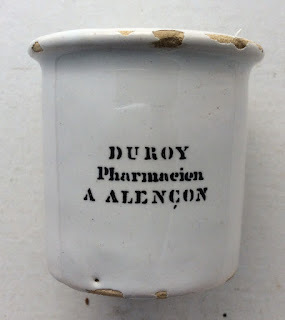 This ointment was produced and distributed by the family. 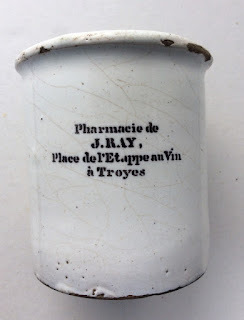 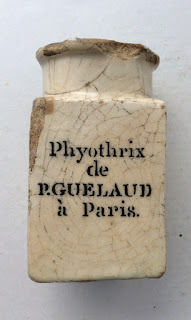 In the nineteenth century, Dr. Jules Theulier was nicknamed "a physician of the poor" for his charity and kindness, and in recognition of his work, a street in Theviers bears his name. 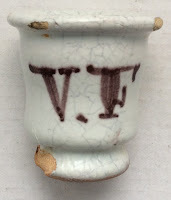 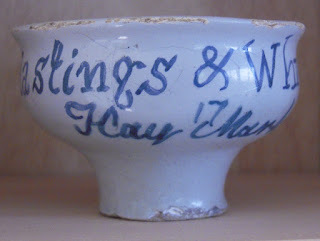 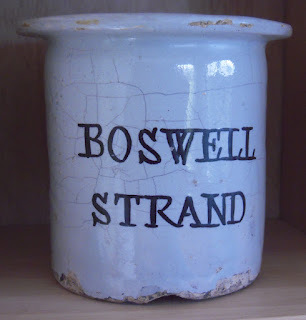 The very early pots bear hand painted initials, and after that, they were stenciled. 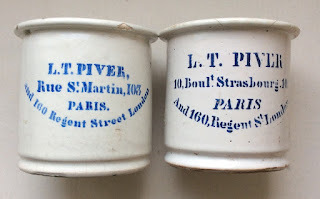 Below is a gallery of some of these pots which are all variants in print, shape and size. 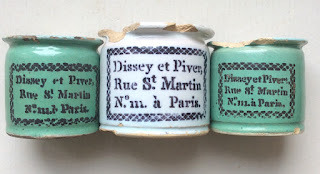 The early first hand painted ones are of course the most desirable, the first three shown in the gallery below. 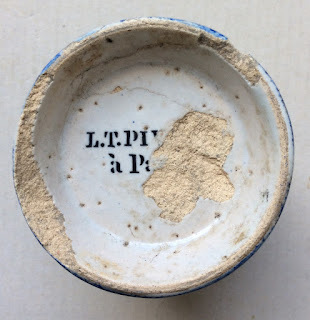 The others are stencilled - all underglaze transfers. 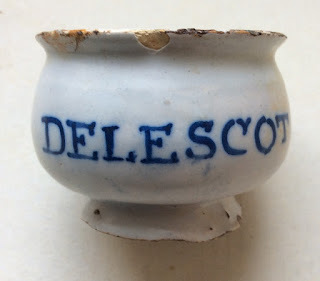 Further information regarding the history of the Delftware pots can be found in the Historical Guide to Deltware and Victorian Ointment Pots book produced by Messrs. Houghton & Priestley.